Find an Elvis Tribute Act for hire near you in minutes! Option 1. Enter your event location below & contact an Elvis Tribute Act directly! Option 2. Request multiple quotes from available Elvis Tribute Acts Get Quotes! Option 3. Read information & advice on hiring Elvis Tribute Acts Read Advice! 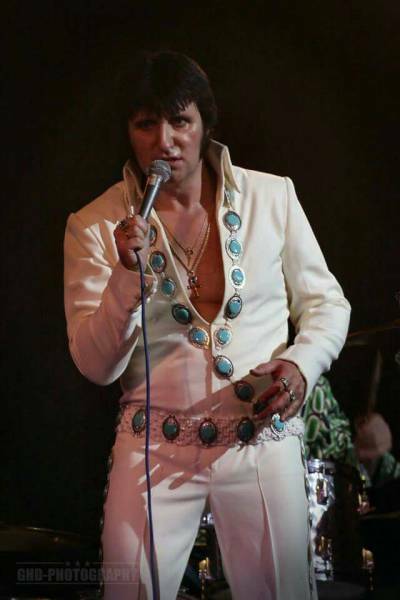 WANT TO KNOW MORE ABOUT ELVIS TRIBUTE ACTS? Read on for the most comprehensive guide to booking an Elvis Tribute Act, including how much an Elvis Tribute Act costs, exactly what they will do at your event, plus tips, advice and information to help make your event one to remember! 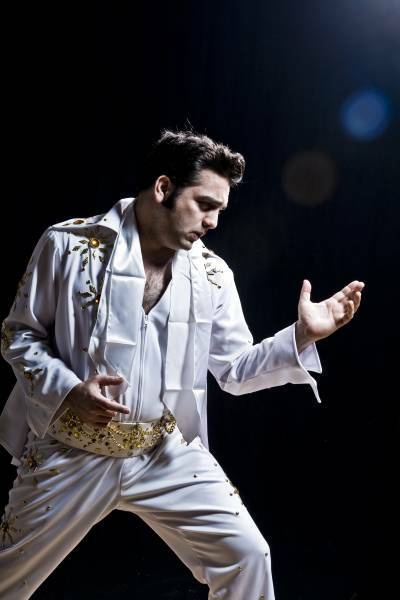 An Elvis Tribute Act will lip-curl, shake his hips and sing the Rock ’n’ Roll music that Elvis helped to create! What exactly will an Elvis Tribute Act do at your event? An Elvis Presley Tribute Act, or and Elvis Impersonator, will bring the true spirit of Rock ’n’ Roll to your event that will span the King of Rock ’n’ Roll’s 20 plus year career! Starting with the 1950’s classic ‘Heartbreak Hotel’, all the way down to the 1970s funk of ‘Burning Love’. The Elvis Tribute Act will consider all songs sung by the great man! The Elvis Tribute Act will not only imitate Presley’s world famous lowly warble, but will also impersonate Elvis’ fantastic stage persona as well. This will include everything from all of the Elvis dance moves you may have come to love and respect, to the way that Elvis held his microphone! You can also expect a lot of costume changes to keep up with Elvis’ constantly evolving eras! From the 1950s Elvis quiff to the Las Vegas white suit of the 1970s! Mainly, an Elvis Tribute Act will entertain your audience with a fantastic live show that will put the wow factor into celebrations and impress your guests, whatever their entertainment tastes may be. What event types are Elvis Tribute Acts hired for? If you are mad about Elvis, then you may want to hire an Elvis Tribute Act to sing at your wedding ceremony?! An Elvis Impersonator will have an almost endless catalogue of Elvis songs ready and rehearsed to croon for your listening pleasure! They can firstly be set up to sing a nice, relaxed Elvis number as the wedding guests enter the wedding venue. Then, the Elvis impersonator can sing one of Elvis’ top romantic songs as the bride walks down the aisle. (May we recommend Elvis’ beautiful ‘I Can’t Help Falling in Love with You!’ And after the ceremony, the Presley Tribute can then sing one of the many upbeat Elvis numbers such as ‘Viva Las Vegas!’. Is Elvis the best singer for you?! Then you might want to hire an Elvis Tribute Act for the wedding drinks reception! 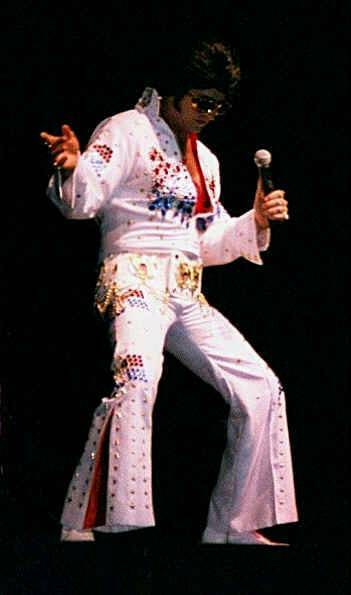 The Elvis Tribute Act will create a priceless moment at your wedding drinks repletion when he croons famous Elvis songs. This can be happening whilst the wedding photographer is snapping away and as the wedding cake is cut! This way, when you think of Elvis, he will always remind you of your perfect wedding drinks reception! Whilst the newlyweds and their family and friends are relaxing and eating their meals at the wedding breakfast, why not hire an Elvis Tribute Act to serenade everybody! The Elvis Impersonator can walk from table to table singing songs, or be set up on the main stage at wedding breakfast venue! The guests will still be able to chit chat over the top of the background music and it will be a great ice breaker for the guests that have never met before who are on the same table as each other! ‘Well it’s a one for the money, two for the show, three to get ready now go cat go!’ This is the famous opening lyrics to one of Elvis’ top songs ‘Blue Suede Shoes!’. Expect to hear this Rock ’n’ Roll classic blasting out of the speakers if you hire a live Elvis Tribute Act for your wedding evening reception! The great thing about Elvis’ songs is that the styles are so versatile! One minute the Elvis Impersonator will have you bopping and doing the twist to ‘Jailhouse Rock’ and the next minute you will be slow dancing with a loved one to one of the best Elvis ballads like ‘If I can Dream’. There are many reasons to hire an Elvis Tribute for your corporate event entertainment! One of the reasons being that Elvis’ popularity continues to grow and so you can guarantee that an Elvis Tribute Act will be a big hit with colleagues and clients of all age groups! The Elvis Tribute Act will be a big crowd puller at a trade show or a product launch, especially as it will have a nostalgia feel to it! Elvis’s brand is great for selling a vast amount of products from food to clothing to cars to hair products! Book an Elvis Tribute Act for your party entertainment and you will not be disappointed! Because Elvis is an icon the world over, you will find that Elvis is impersonated in China, the US, Russia, the UK, India and almost every other country you can think of! An Elvis Tribute Act is great for a whole host of parties including a birthday party, a wedding anniversary party, a 1950s Rock n Roll themed party, a Hawaii themed party, a Las Vegas themed party and just about any other type of party you can think of! It’s worth noting that when you hire an Elvis Impersonator, the singer can tailor the setlist to your request. We advise to use our personal messaging service to message the impersonator to enquire. How much do Elvis Tribute Acts cost to hire? Our simple to use entertainment directory allows you to firstly search for the best Elvis Tribute Acts who are local (or travel to your area) and then via the contact form you may message them directly to enquire for a no obligation quote to perform at your event. This way, there will be no ’Suspicious Minds’ when it comes to the cost! Some acts will also add a rough price guide to their profile for your convenience. What are the usual set formats and performance length for Elvis Tribute Acts? An Elvis Tribute Act can tailor their performance to times to suit you and your event, however, on average a professional Elvis Tribute Act will perform for two 45 minutes sets. How much space will an Elvis Tribute Act need at your event? This will depend. If the Elvis Tribute Act is a solo performer, singing over professional backing tracks, or whether the Elvis impersonator uses a full backing band to perform a full Elvis show. We advise to use our personal messaging service to enquire with the act. What equipment and set up requirements do Elvis Tribute Acts need? As with most artists who sign up to Entertainersworldwide.com, an Elvis Impersonator will provide all of their own equipment. This may include: You may want to enquire if an artist needs a PA to amplify their sound, in which case we would advise to use our easy to use messaging service to find out. We do ask that each performer gets a backstage area in which they can prepare for the performance ahead. If your venue does not have a backstage area, then we kindly ask that you enquire with the venue to seek an alternative space in which the performer can comfortably get ready to entertain. How can you find and book an Elvis Tribute Act with Entertainersworldwide.com? WANT TO RECEIVE A RANGE OF QUOTES FROM Elvis Tribute Acts?